The Ellis-Singleton building, an eight-story brick office building constructed in 1929, is nominated for its significance in the area of Architecture as an Art Deco style office building. The building was designed by the architect firm Schmidt, Boucher, and Overend. It was the first in Wichita with a connected ramp garage, appealing to "business and professional men who like the idea of having their cars where they may step directly from their office floor." Engine House No. 6 was nominated for its association with local government firefighting at the turn of the century. Built in 1909, No. 6 was the last horse drawn fire station in the city. When No. 6 switched from horses to gasoline powered engines "Wichita became the first completely motorized fire department in the United States, and the second in the world." The design of Engine House No. 6 is also notable with Tudor Revival characteristics. 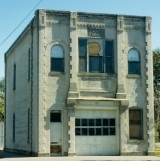 Its brick concrete structure and arched windows are unique features not found on contemporary fire stations in the area. 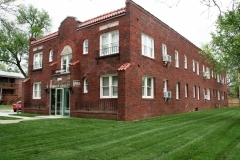 Constructed in 1930, the Fairmount Apartment building was designed to provide multi-family housing in the Fairmount neighborhood immediately south of Wichita State University. A trolley line connected the university neighborhood to the rest of the city. Population growth during the booming 1920s triggered an increase in multi-family apartment construction in Wichita. By 1927, there were 91 apartment buildings listed in the Wichita City Directory, a number that increased nearly three-fold by 1947. 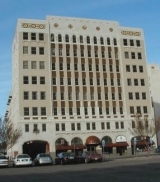 Wichita contractor John I. Graham, who is known to have built three Wichita apartment buildings between 1928 and 1930, applied for a building permit to construct this building for an estimated cost of $35,000. This conventional, low-rise apartment building exhibits the characteristics of the popular early twentiethcentury Spanish Colonial Revival style. 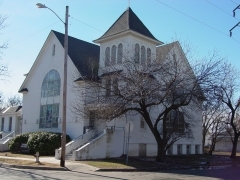 The building was nominated as part of the "Residential Resources of Wichita, 1870-1957" multiple property listing for its architecture. Built in 1910, the Fairmont Congregational Church is a two-story, Akron-plan, brick veneer church designed in a vernacular interpretation of the Richardsonian Romanesque style by Wichita architect William R. Stringfield. The church is nominated for its application of the Richardsonian Romanesque style to religious structures. It is also nominated in the area of communication for its association with Reverend Clayton B. Wells, who was the first to broadcast religious sermons in the Wichita area in the 1920s. Built in 1888, this two-and-one-half story Queen Anne home was designed by Willis T. Proudfoot and George W. Bird. Proudfoot and Bird were two of the most highly regarded architects in Kansas during the 1880s and 1890s. Wichita lumberman A.S. Parks first occupied the house from 1888 to 1892. The home's primary Queen Anne features include the irregular floor plan, wood shingle siding, decorative gables, varying sizes of windows, and a full-width porch supported by wood columns. It was nominated as a good local example of Queen Anne architecture. 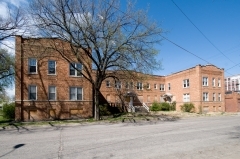 Built in 1924, the Fairview Apartment building is located a few blocks south of Wichita's North End commercial and industrial district. Through the start of World War I, industrial development in the North End spurred residential and commercial growth. A dramatic rise in population during the booming 1920s, coupled with a desire for safe, sanitary housing and a shortage of building materials and skilled labor, triggered an increase in multi-family apartment construction in Wichita. This conventional low-rise apartment building has sixteen residential units on each of the first and second floors. The design of the Fairview Apartments reflects popular architectural trends in multi-family housing seen in Wichita and nationwide during this period. Apartment buildings typically had brick veneer walls with limestone or cast stone trim applied to fireproof, concrete or even steel structures. This building has a U-shaped plan and features buff brick walls with patterned brickwork at the cornice and a flat roof with a shaped parapet. The bracketed door hoods with exposed rafter tails and multi-light upper window sashes express vernacular elements of Craftsman architecture applied to a multi-family building. The building was nominated as part of the "Residential Resources of Wichita, 1870-1957" multiple property listing for its architecture. The Farmer's and Banker's Historic District is located on the northeast corner of First and Market Streets in Wichita. In April 1909, Wichita Club members approved a design by the Kansas City architectural firm of Keene and Simpson. The two-building district, consisting of the former Wichita Club and Elks Club buildings constructed in 1911 and 1925 respectively, forms a solid block. The buildings complement each other in materials and their Commercial-style design. They are both five stories tall, have flat roofs, and display tripartite façades faced with red brick and classical ornamentation. The buildings were nominated for their architectural significance. 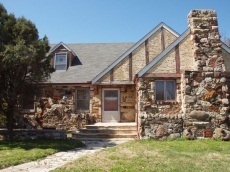 Frank Garrett and stonemason George Ewing built the house at 1301 Cleveland in 1942 for Dr. James E. Farmer and his wife Gertrude, who were both prominent African American professionals in Wichita. It is located in the McAdams neighborhood, and, like the McClinton Market, is representative of population changes during the first half of the twentieth century, when the area changed from primarily white residents to over ninety percent African Americans by the end of World War II. The house is an excellent example of a folk interpretation of the Tudor Revival style. It embodies the distinct characteristics of the style while also reflecting the personality and craftsmanship of the African American builder and mason. Not only did this property serve as the Farmers' residence, but it played host to prominent visiting African Americans, such as singer Marian Anderson and boxer Joe Lewis, until segregation in public accommodations was outlawed in Kansas in 1963. 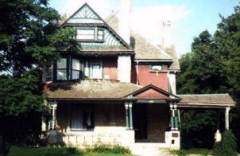 The property was nominated as part of the "African American Resources of Wichita" multiple property submission for its local significance in the areas of African American heritage and architecture. 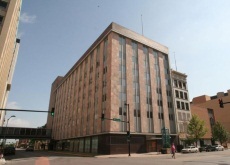 The Fourth National Bank Building is located in the central business district of Wichita. The building served as the bank's headquarters from 1916 until 1971, when the bank moved to a new building. It was constructed as a six-story building in 1916, and a seventh story was added in 1923 along with a seven-story addition to the east. In 1958 a seven-story rear addition was constructed to the north and the building's exterior was completely redesigned to reflect the Modern style. A local architectural firm, Thomas, Harris, Calvin Associates, oversaw the mid-century design changes, which carried through to the interior. Exterior changes included the installation of vertical panels in pink marble and deep red granite with elongated aluminum-framed windows and aluminum fluted spandrels. 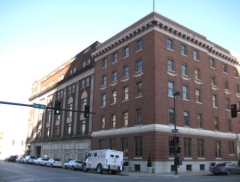 These renovations took place during a period of rapid growth and change within Fourth National Bank when its management was restructured to increase efficiency, computing machines were introduced to streamline accounting and bookkeeping, and new departments were created. Thus, the building was entirely remodeled to create an efficient environment. It was nominated for its local significance in the areas of commerce and architecture. 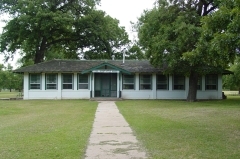 Constructed in 1921, the Fresh Air Baby Camp is a one-story, concrete block structure faced with brick and rendered in white stucco. The Fresh Air Baby Camp is nominated for its association with the social movement in Wichita to provide better healthcare for its citizens. It is also being nominated as a representation of the works by prominent Wichita architect Lorenz Schmidt and builder George Siedhoff.